Only her state cracked down on the labour strike. Is Mamata Banerjee insecure ahead of polls? Has West Bengal entered another cycle of political violence ahead of next year's polls? West Bengal is making headlines again. And not just because of the sordid saga of Indrani Mukerjea. The showdown between the ruling Trinamool Congress and the Left parties over the trade union strike on 2 September has left the state shaken. The government tried too hard to assert its power by disrupting the strike, which was also supported by the Congress. Violence inevitably ensued. The violence was meant to send out a clear message: that the ruling party won't allow any voice of opposition even if it's not directed at its "Manoniya Mukhyamantri" Mamata Banerjee and her government. This is worrying given that assembly polls are due next year and West Bengal is notorious for electoral violence. West Bengal is known for its bandh culture. Frequent strikes during the three decades of the Left rule until 2011 cost the state hundreds of work days, resources and revenue. The Trinamool, in fact, led many such strikes, which often turned violent. But when Mamata became chief minister, she announced a ban on bandhs. The people breathed a sigh of relief, not knowing that violence would continue, only now in the name of dismantling the bandh culture. So it continued with the latest bandh. The strike, unlike elsewhere in India, led to a direct confrontation between the ruling party and the opposition. That the strike was called against the central government for eroding labour rights didn't matter to the Trinamool supporters in Bengal. They took it upon themselves to attack the striking workers. This was, in effect, an attempt by the ruling party to intimidate the Left parties just when they are trying to regain their lost strength in the run up to the assembly election. This strike was seen by the Left, particularly the CPM, as an opportunity to put up a show of strength like in the old days of mass mobilisation. "How many of us are aware of the issues the strike was called for? No one put it on the banners; no leaflets were distributed. Here it was just a bandh called by the Left parties, not a trade union strike," said Sadique Hossain, a Sahitya Academy Yuva Puraskar winning author. "The political parties probably didn't want the people to know the real issues. The Trinamool is scared that if the opposition gains strength on any pretext, it may hurt the party in the next election. That's why the police and party supporters were visibly active and used force at the slightest provocation." It's a tested Mamata Banerjee formula: since taking power, she has consistently used the state machinery to keep bandhs from disrupting people's lives and factory production lines too much. This time though, she failed to read the people's pulse, and the crackdown backfired. "Violence has become a kind of a measure of success of a bandh. The state showed an ignorant approach towards peaceful a democratic protest, which is our right," said social activist Santasree Chowdhury. "On the other hand, no political party is actually bothered about the labourers. In Bengal, so many factories have closed, there is no new manufacturing push, workers are migrating and going into the unorganised sectors." "Jobless, frustrated youth are growing in number and the political parties are taking advantage of the situation," Chowdhury added. "This was so in the past and it is the same now." 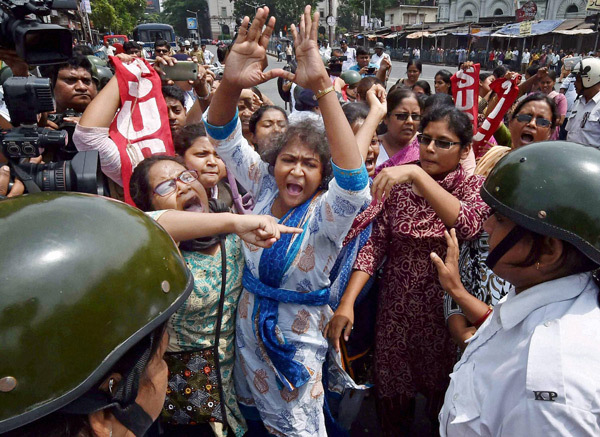 The violent crackdown on the striking workers has also given the Left a stick to beat the Trinamool with. "It was a strike against the labour laws of the Centre, not against the state government. But they proved that in reality they are holding hands with BJP whatever they may say," said Veteran CPI(M) leader Sujan Chakraborty said. "When they realised that people are supporting the strike and the Left parties are gaining support, they attacked." "Across India, the strike was peaceful, even in states ruled by the BJP. 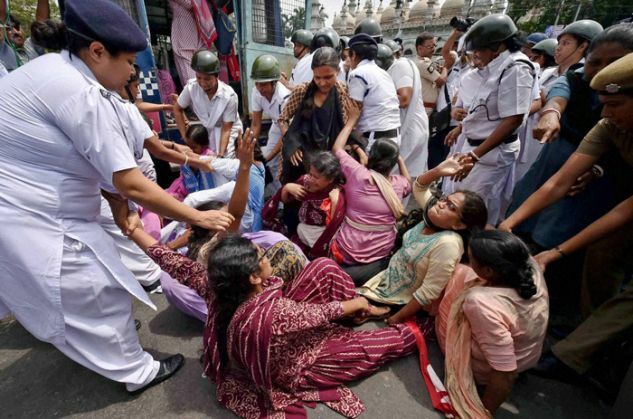 In Bengal, the state used force to suppress people's voice." Panchayat and Rural Development Minister Subrata Mukherjee, however, refuted the allegations. "It was not a successful strike at all. People were forcibly stopped from going to work places. Private offices and factories were shut due to fear," he claimed. But why did his party supporters indulge in violence? "It didn't happen in Kolkata. A few reports came from the districts. And it was all provoked," the minister said. "The opposition wanted more violence to happen to show they were attacked, they wanted bullets to fly. But we maintained peace as much as we could, we didn't fall into their trap." As for the people of West Bengal, they seem to be eternally trapped in recurring cycles of violence. And they are the biggest losers of this political dysfunction. TWEET THIS Only her state cracked down on the labour strike. Is Mamata Banerjee insecure ahead of polls? Has West Bengal entered another cycle of political violence ahead of next year's polls? READ NEXT >> From Buddha to Kabir: Would they survive today's violent fundamentalism?